ChazzCreations - Lick Skillet ~ Adamsville Joseph Shaw moved his family from SC to Lickskillet, GA (near Atlanta, was later changed to Adamsville). Founded as a farming village, Adamasville was possibly named for early resident G. W. Adams, who farmed there in 1882 when it was called Lick Skillet. The name was changed to Adamsville in 1906. Joseph died during the Typhoid fever breakout, 1853. After Josephs death, the family moved a little north of Dalton, GA. There is a huge section called Red Clay, near Cohutta, GA, and a rail system ran through there. This is when the war between the states broke out and Gardiner Shaw left for the Georgia Regiment in 1861. Early history of Lick Skillet The early history of Lick Skillet and this area, was closely tied to the roads that led from ferries and bridges at the Chattahoochee River to downtown Atlanta. Originally called Lickskillet, this settlement is now known as Adamsville; the name was changed in about 1870, one year after the founding of the Adams Lodge a Masonic organization, organized by George W. Adams. The town of Adamsville grew up around the junction of these roads and most likely served as a community center for the surrounding land area. Dollar Mill Wilson (1775-1839) was the first member of the Wilson Family to settle here arriving in 1853. His son, Judge William A. Wilson, built a house on the original home site between 1856-1859. This building at 621 Fairburn Road, survived the Civil War and still stand, albeit in a deteriorated state. It is made notable by a story that General Sherman tied his horse in the downstairs hall while spending the night there in 1864. In 1871, Adams deeded the property with a two-story house to the Adamsville Lodge Number 171 for meeting purposes. First Saint John Missionary Baptist Church which was organized as Saint John Baptist Church in 1883, is still located on Fairburn Road. However, the present church building was constructed in 1972. Fain Elementary School is apparently the descendant of Hemphill School, which is shown on an 1893 map of Fulton County. Fain Elementary School built in 1927, is named for Margaret Fain, whose family resided in this area for many years. In 1930 the population of the Adamsville District was given as 1,176 reflecting the rather sparse settlement that existed at that time. A winding dirt road of the 1860s which passed Ezra Ch. (S.E. cor. Mozley Park), & continued S.W. to Gordon Terrace, where it joined Gordon R. & ran westward to a cross-roads settlement called Lick Skillet, now known as Adamsville. The road, Mozley Drive, did not exist in 1864. 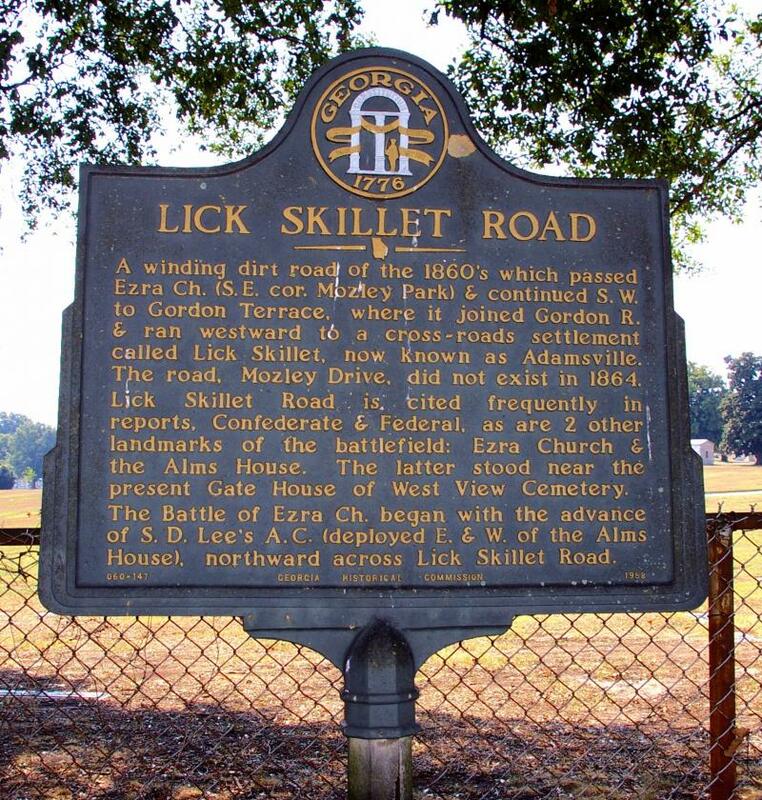 Lick Skillet Road is cited frequently in reports, Confederate & Federal, as are 2 other landmarks of the battlefield: Ezra Church and Alms House. The latter stood near the present Gate House of the West View Cemetery. The Battle of Ezra Ch. began with the advance of S.D. Lee’s A.C. (deployed E. & W. of the Alms House), northward across Lick Skillet Road.﻿The lone headstone near the wood line marks the grave of a Confederate officer named Lt. Edward Clingman who died in the Battle of Ezra Church. There is a small section of Confederate earthworks in the woods behind the headstone. Westview Cemetery, a marker describes the Battle of Ezra Church. Putnam Darden’s Mississippi Battery was stationed near here on the hill behind the Alms House (poor house) that served as a battlefield landmark. This battery support Brown’s assault on the Federal lines near Battle Hill.﻿ Mozley Park, the site of Ezra Church, name sake of the battle. The Federal lines came to this point and started to turn in a generally north eastern direction. Wangelin’s Brigade of Wood’s Division, 15th Corps(US) was positioned here at the church and extended just to the east. Williamson’s Brigade of the same Division was positioned at the church and extended just to the north east. They used the church pews and wood from the church to fortify their position and fend off the attacking Confederates of Clayton’s Division.﻿ The original main entrance, now closed, to Westview Cemetery, sits on the site of what was once the Alms House (poor house). This was a known battlefield landmark and Brown’s Division of S.D. Lee’s Corps, formed their lines of battle in the area as they prepared to assault the right side of the Federal line.﻿It was not until the 1950’s and early 1960’s that major development reached West Atlanta. This growth is reflected in the number of new subdivisions, commercial outlets and schools. The initial phase of the Boulder Park subdivision was platted in 1951. It was not until 1958 that Carroll Heights, Fairlane Heights & other subdivisions were planned. Collier Heights Plaza was developed in Adamsville in the early 1960’s to accommodate the growing residential community. Schools were also constructed to serve the increased school age population. Towns Elementary (1935), Harper High School (1963), Miles Elementary and Adamsville Elementary are named for distinguished graduates of colleges in the Atlanta University Center Complex. George A. Towns (1870-1861) Charles Lincoln Harper (1877-1966) Leonora P. Miles (1872-1973) Interstates 20 and 285 were also constructed during the sixties. The main artery leading from Adamsville into downtown Atlanta is now known as Martin Luther King, Jr. Drive. Earlier names for the road were: Gordon, Garrett’s Bridge, Adamsville, Lickskillet and Howell’s Ferry. Joseph Shaw moved his family from SC to Lickskillet, GA (near Atlanta, was later changed to Adamsville). Founded as a farming village, Adamasville was possibly named for early resident G. W. Adams, who farmed there in 1882 when it was called Lick Skillet. The name was changed to Adamsville in 1906. Joseph died during the Typhoid fever breakout, 1853. After Josephs death, the family moved a little north of Dalton, GA. There is a huge section called Red Clay, near Cohutta, GA, and a rail system ran through there. This is when the war between the states broke out and Gardiner Shaw left for the Georgia Regiment in 1861. The early history of Lick Skillet and this area, was closely tied to the roads that led from ferries and bridges at the Chattahoochee River to downtown Atlanta. Originally called Lickskillet, this settlement is now known as Adamsville; the name was changed in about 1870, one year after the founding of the Adams Lodge a Masonic organization, organized by George W. Adams. The town of Adamsville grew up around the junction of these roads and most likely served as a community center for the surrounding land area. Dollar Mill Wilson (1775-1839) was the first member of the Wilson Family to settle here arriving in 1853. His son, Judge William A. Wilson, built a house on the original home site between 1856-1859. This building at 621 Fairburn Road, survived the Civil War and still stand, albeit in a deteriorated state. It is made notable by a story that General Sherman tied his horse in the downstairs hall while spending the night there in 1864. In 1871, Adams deeded the property with a two-story house to the Adamsville Lodge Number 171 for meeting purposes. First Saint John Missionary Baptist Church which was organized as Saint John Baptist Church in 1883, is still located on Fairburn Road. However, the present church building was constructed in 1972. Fain Elementary School is apparently the descendant of Hemphill School, which is shown on an 1893 map of Fulton County. Fain Elementary School built in 1927, is named for Margaret Fain, whose family resided in this area for many years. In 1930 the population of the Adamsville District was given as 1,176 reflecting the rather sparse settlement that existed at that time. The lone headstone near the wood line marks the grave of a Confederate officer named Lt. Edward Clingman who died in the Battle of Ezra Church. There is a small section of Confederate earthworks in the woods behind the headstone. It was not until the 1950’s and early 1960’s that major development reached West Atlanta. This growth is reflected in the number of new subdivisions, commercial outlets and schools. The initial phase of the Boulder Park subdivision was platted in 1951. It was not until 1958 that Carroll Heights, Fairlane Heights & other subdivisions were planned. Collier Heights Plaza was developed in Adamsville in the early 1960’s to accommodate the growing residential community. Schools were also constructed to serve the increased school age population. Towns Elementary (1935), Harper High School (1963), Miles Elementary and Adamsville Elementary are named for distinguished graduates of colleges in the Atlanta University Center Complex. George A. Towns (1870-1861) Charles Lincoln Harper (1877-1966) Leonora P. Miles (1872-1973) Interstates 20 and 285 were also constructed during the sixties. The main artery leading from Adamsville into downtown Atlanta is now known as Martin Luther King, Jr. Drive. Earlier names for the road were: Gordon, Garrett’s Bridge, Adamsville, Lickskillet and Howell’s Ferry. Joseph Shaw died during the Typhoid fever breakout, 1853. After Josephs death, the family moved a little north of Dalton, GA. to Cohutta. The architecture of the small city gives the impression that it once displayed a vibrant little downtown; this is perhaps due to the once booming railroad system that still rumbles through Cohutta. Indeed, Cohutta reflects the trajectory of many smaller towns in the United States. The town emerged as a stop on the railroad from Cleveland, Tennessee to Dalton, Georgia, and served as the center for the surrounding farming areas. According to local lore, the town was originally known as "Shakerag," from the rag would-be passengers would wave to stop trains passing through. In the 1920s, the town had a bank and a hotel, as well a high school, and was frequented especially in summer by inhabitants of Chattanooga seeking cooler temperatures. The high school burned down in 1952, and was not rebuilt. As late as the late 1960s, Cohutta had a small supermarket, as well as three smaller "sundry" stores, a feed and seed, and the hair salon that is obligatory in practically in all small towns in America. The improvement of roads, and the ease of access to larger cities (in this case, Dalton), drew shoppers away, so that by the 1990s, Cohutta had no businesses at all. Over the last decade, the surrounding area has become something of a bedroom community for Dalton, with housing developments taking over many of the farms in the area. Whether the "gentrification" of the area will lead to a revival of Cohutta itself is problematic. Cohutta also prides itself on the Red Clay State Historic Park that serves as a national Native American meeting ground, Cherokee memorial with a museum, as well as an outdoor park and recreation center for visitors. This part of the state is extremely rich in Cherokee history as well as classic southern heritage that is complemented by the foliage of Georgia and Tennessee.